Today I am flying high! Yes…up in the air! Why? Because I’m reviewing . . .
Synopsis: (from Barnes & Noble) Princess Cinnamon Stitch is a tomboy who has no interest in courtly life. To her parents’ dismay, she cartwheels through puddles and dances with flea-ridden cats. Discover how she succeeds in teaching the king and queen that there are more important things in life than decorum and show. Laura-Kate Chapman’s eye popping artwork makes this rhythmic text soar. Opening: There once was a princess called Cinnamon Stitch. Her parents were stuffy and terribly rich. With Cinnamon looking exceedingly grand. Their daughter would be the most happy of girls. Then called for the seamstress, who made her some more. 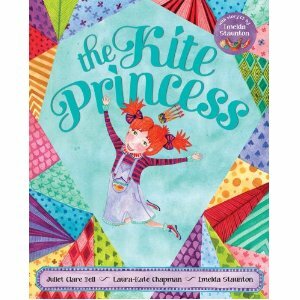 Resources: In the back of The Kite Princess are instructions for building your own kite. I found a Kite Themed Mini Unit at First Grade with Miss Snowden has activities for everything from contractions to fact families…pages of activities with a kite theme. HERE are some activity sheets created by the author, Juliet Clare Bell. Why I Love This Book: First of all, the Kite Princess is written in rhyme and you know how I love a good rhyming picture book 🙂 I fell in love with Cinnamon Stitch (is that not the cutest name?) and her tomboy ways. I like how she remains a dreamer even the king and queen think she is conforming. The story ends perfectly as Cinnamon’s influence rubs off her parents and they trade in their stuffiness for a little fun! The book is accompanied by a CD of the story, read by Oscar-nominated actress, Imelda Staunton. To find more perfect picture books, head on over to Susanna Leonard Hill’s blog and check out all the fantastic selections! Each book is reviewed by a picture book -lovin’ reviewer, AND includes activities to go along with the book. You will find a handy list right HERE. You know, I have yet to read this book even though I’ve seen it all over the place! I love the name Cinnamon Stitch! And I love that she stays true to herself! Thanks for sharing this great pick, Penny! Awwww, cute. My little one’s best friend is a tomboy. I bet she’s love this book. She’s so adorable, preferring tennis shoes to mary janes and jeans to dresses. Penny…so glad you reviewed this one…I had heard of it…now I know I want to read it. :) Good for Cinnamon Stitch…yup, GREAT name…she knows what she likes and doesn’t like…great message for kids who feel they have to conform to what others like. Love this – and the princess’ name! I will def. look for this. I had my grandgirls one afternoon to myself and we were watching Mary Poppins. Just at the end their mom and dad, aunt and uncle and my husband came in…when “Let’s Go Fly A Kite” started we were all singing – except for the sons-in-law who stood looking out of the corner of their eyes, looking a little uncomfortable. After the song was over the one said, “do you realize that not EVERY family thinks their life is a musical?” Hee-hee…looking forward to this book. She sounds like my kind of girl!! Hope my library gets this soon! I love the rhyming in this book! The opening is grand. Great cover. Looks like a wonderful story about a princess who wants to interact with the world, and a fun book kite-flying in the spring. I would choose this book just by its cover! What wonderful colors and patterns – a kite quilt. Very cute and smart! I’m going to look it up. This looks like a fun one. I enjoy reading a good rhyme book. Ooh! Another kite book! With the patchwork on the cover, I’m guessing Cinnamon has a beautiful kite.